Consider ASAP Globalizers, an alliance between SAP certified Language Services Partners working together as a one-stop-shop for all your SAP related language and language training needs. Imagine an all too common scenario: you have your software or master data, 10 subsidiaries that need to implement it – each speaking a different language – an international customer base and 8 potential new markets (or unhappy customers) to appeal to in their own language. It is clear why you might decide to translate. But just understanding why and for whom you need to translate only informs the overall translation strategy, the languages used and the choice of tools to accomplish the job. The tricky bit is actually managing your translation. Another example: you have a customization or plug-in or app to translate; you are possibly working to a tight budget. You are not sure how to approach the project. The first questions to ask are “what do I need to translate?” and “where am I translating in?”, All this can happen within the SAP system (yes, you can in SE63!) or by extracting the stings in an excel or another format. Each strategy has its Pro and Cons, but by keeping a close eye on cost and efficient use of your budget, an ideal solution depends very much on the specific circumstances of the project. Repeatability and volume are key: the bigger the volume, the more efficient and cost effective it is to translate directly in the SAP system. If the project is small, or you need to translate an app, it might make more sense to externalise all the content in an excel file, or to work directly on the property file. Why is it so important to know which environment to translate in? It is because it requires different sets of skills, which, in the first case, very few LSPs can offer. ASAP Globalizers, covering 18 countries and 25 languages, offers services provided by Certified SAP Language Services Partners as well as technical consultancy within and outside the SAP system, at very competitive rates. Although working within the SAP system environment might sound taxing (translation in SAP is not usually a well-known field of expertise), if supported by an experienced partner, it is a very cost-effective solution. First, you can use our own consultancy services to prepare the translation environment, possibly in a non-productive system. Then, we can provide you with an experienced team of linguists who know everything there is to know about translating in SAP: they know the specific jargon; they know what a domain is, what a collection is, how to run QA processes on their strings and are expert in the specific field and, above all, they will not use the SAP ERP language for an app. Third and paramount, we can offer you a precise scoping of the project, and hence, a very transparent cost estimate throughout the project, even in dynamic environments, where development is done in parallel with the translation. This means you will have a very clear indication of costs from the very beginning, based on the objects and collections you need or want to translate, excluding all that is not relevant or that can be safely supplemented with English (i.e. more technical collections). Overall, working within the SAP system is a very versatile and effective solution, with inbuilt translation memory and tools that improve the translation efficiency and avoid costly issues caused by errors while importing translated excel files. It is a strategy, which, on average, allows to reduce translation costs between 15-30%, with very satisfactory results for our customer, and without having to haggle on word prices. Many of our major clients have signed up for this approach. But it is not the only possible solution we offer. Externalising files from the system may require a major administration effort from your side, but could be the best solution for smaller projects. When working on a file, the estimate will be word-based, adjusted per matching on pre-existing occurrences. It is an approach that makes sense, especially if you have a pre-existing translation memory to leverage. Also, in this scenario, a very skilled translation team is needed, one conversant with SAP language, able to run QA processes based on SAP specific terminology in order to guarantee a seamless integration with the existing SAP software system; and one able to consult and integrate the existing SAP terminology. In these situations, the estimate is word-based, but the word price is then adjusted by the amount of matchings found during a pre-analysis phase. Thus, the bigger and the more relevant the translation memory, the lower will be the costs. Savings can be substantial in this scenario, but the input required from you is bigger. 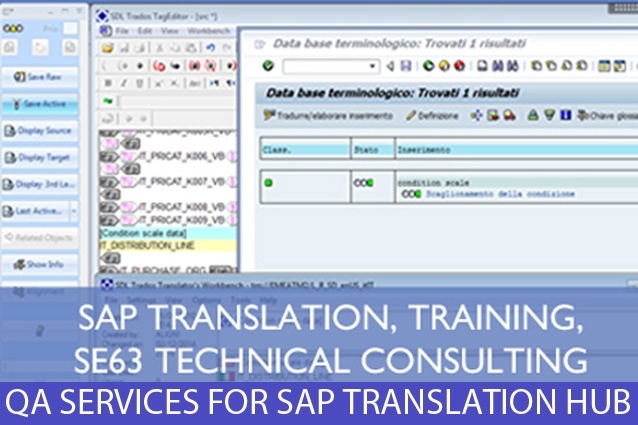 And finally, it’s worth mentioning the SAP Translation Hub. Firstly, what is it? And secondly, is it that suitable for your translation purposes? The SAP Translation Hub was developed to offer developers an instant translation of reused SAP strings during the development of their own applications in SAP 4/HANA. It is a repository, integrated with machine translation and based on SAP legacy translations. It is not a tool developed for linguists and it does not include a translation memory. Once a string is changed in the post-editing phase, identical source strings are not automatically updated, nor the repository, and that changes are not “remembered” from one release to the other. In short, it requires a substantial “versioning” and “change tracking” effort by those in charge of managing the translation project, be it on your side or done by us, impinging on its cost-effectiveness. In our view, the SAP Translation Hub is very useful for translating a property file on the go, or a small app. However, as soon as volumes go up, the “savings” it promises are offset by higher admin expenses to guarantee coherence within the translation and between releases. Would we advise its use? As with any translation scenario, it depends on the circumstances. if you have a specific query, ASAP Globalizers, as a one-stop-shop for SAP Languages Services, can agnostically advise you on which solution would best satisfy your specific aims, strategy and expectations, in consideration of the key WHY, FOR WHOM and HOW questions shaping your approach. Should you use the services of ASAP Globalizers?